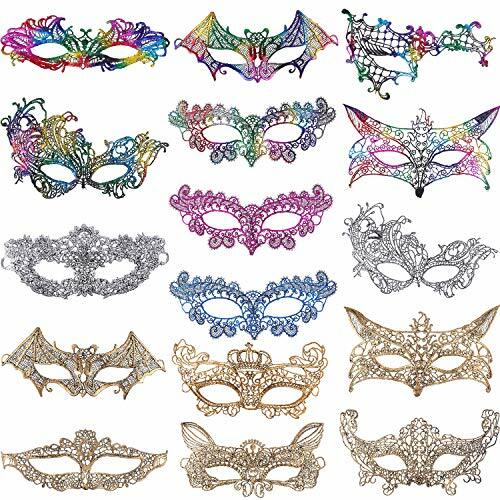 The package contains 16 different styles of masks that you can choose an appropriate mask to accommodate your clothing, charming and mysterious, making you stand in the crowd. You can adjust the looseness of the mask by the ribbon around the mask, the ribbon can help keep mask in place, make it won't fall off easily, fit for most face shapes. Made of lace, exquisite workmanship and detailed deal, charming and elegant appearance, making you become the most mysterious princess at the masquerade ball. Be applied in masquerade balls, masquerade bridal shower, Halloween, holiday party and theme party, or as gifts for families or friends. Wide usage: good for costume parties, carnivals, parties, birthday parties, theatrical productions, nightclubs, costumes cosplay, etc. If you have any questions about this product by Jovitec, contact us by completing and submitting the form below. If you are looking for a specif part number, please include it with your message.